Outdoor Vertical Gardens is an ideal solution to compensate for lack of green open spaces in cities. 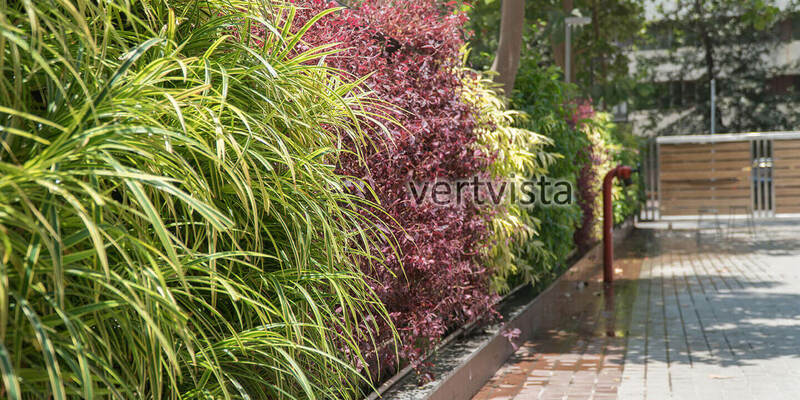 Be it for beautification, creating privacy, adding greenery or growing your own herbs, VertVista can deliver unique custom solutions for outdoor green walls across India. Plant walls break the dull monotony of concrete walls, add freshness and lightness despite space restrictions. Outdoor Greenwall will not only act as air filters but will also reduce the noise pollution by creating barriers for the noise around the surroundings. The outdoor vertical garden creates a layerof protection on the building. During summers it will absorb the heat in the area giving you a cool environment. The Internal space between the building walls and green wall panels considerably reduces the overheating of the wall and reduces the temperature of the building. One can also grow their own herbs, vegetables in Outdoor bio walls. VertVista has successfully built more than 25,000 square feet of vertical gardens. Our dedicated and experienced horticulture team hand pick perfect easy maintenance plants which will ensure a lush wall throughout the year. We offer multiple systems for green walls, depending on the projects requirements. Our in-house team of horticulturists, installers, designers and engineers ensure customized with complete attention to details. VertVista has worked across India for MNCs, architects, developers, retail outlets, institutions and private home owners on projects of varying scales, delivering quality and timely solutions for each. A brand or company’s green and sustainable practices can be conveyed by using the vertical gardens. Vertical gardens create an excellent backdrop while simultaneously enhance the value of the green brand. Green walls can improve the aesthetic appeal and increase the property value. Self-standing bio walls can be used on terraces or balconies to create a natural and intimate usable open space. Green walls can also be used to create a privacy screen from intrusive or unsightly surroundings without creating a sense of confined spaces. One can opt for an outdoor bio-wall for their compound walls, terraces, balconies, lobbies, patio & gardens, recreational & swimming pool area, etc. Herb gardens can be incorporated on plant walls. With growing awareness about balcony gardens and rooftop farming, we are incorporating the best practices from the field of hydroponics and aquaponics into our outdoor vertical gardens and facilitating leafy vegetables to be grown in our vertical garden systems – so that our cities can grow and eat healthy. Outdoor vertical gardens require more water and to prevent wastage of drinking water, we are looking at possibility of using grey water for watering the green wall systems.